Ex Hot Girl: Super Busy and Stuff. With that, here's a picture of me with my latest obsession. 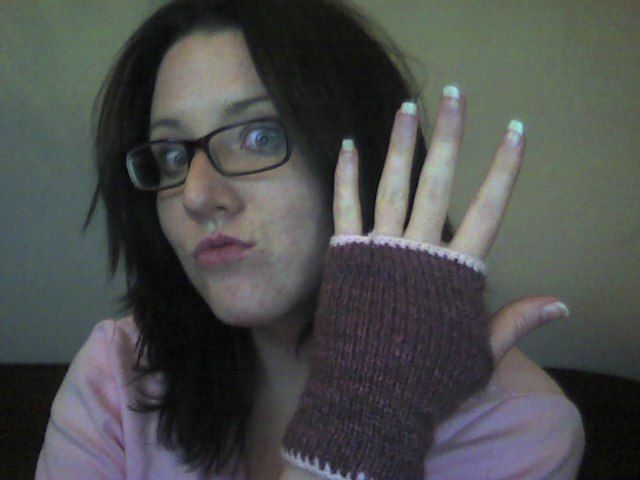 My wrist warmer glove thinggies. I type with them on, I smoke with them on, I eat with them on. Dan now refers to me as his homeless girlfriend. Okay, well I'm off to try to go to bed. It's 1:41am and I am supposed to be up at 8am to meet a Bride and her Bridesmaids at the salon for some getting ready photos! I think it's funny that Dan refers to you as his homeless girlfriend. The glove definitely seals the deal but you would be newly homeless as evidenced by the nails. I am in desperate need of a new pair of glove-type things with no fingers so that I can type. My bosses think it's an awesome idea to keep the AC on year-round so I need to dress for the arctic when going to work. I've tried Target but haven't found them. I'll have to look again.